Present your favorite teacher with personalized teacher gifts that are sure to be used every day. A Personalized Teacher Writing Set is an inexpensive teacher gift with an expensive feel. Each Rosewood Personalized Teacher Pen Set makes a unique teacher gift for him or her. Personalized Pen Set for any teacher is presented with a matching rosewood case for convenient storage and a beautiful gift presentation. Pen measures 6" in length, black ink and features twist action ballpoint operation. The pen can be refilled with a standard Parker refill. 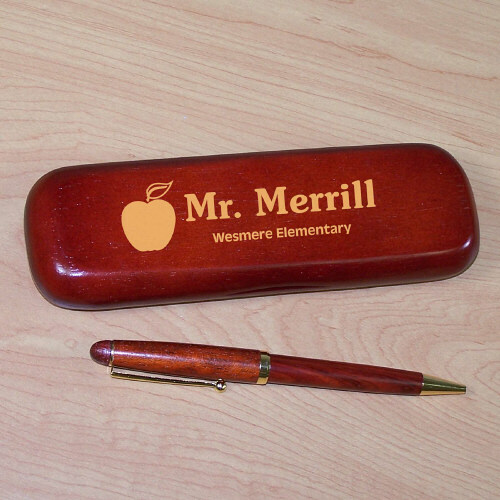 The Teacher Pen Case is personalized with any name and one line custom message (i.e. Mr. Merrill \ Wesmere Elementary). Buy Personalized Gifts For Teachers! Excellent choice came out great! It was a gift for principal. Personalized Teacher Gifts . Personalized Fast & Easy.